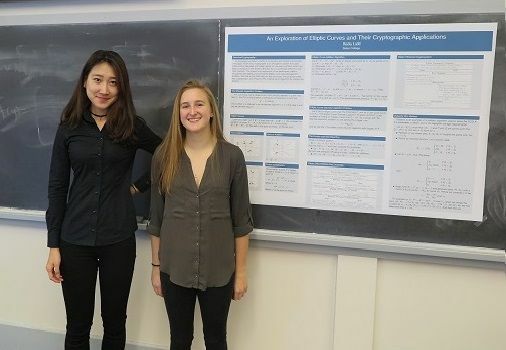 Senior math thesis students Addison Berumotto (Yue Yao) and Becky Ladd after their Winter 2017 presentation. While the capstone experience can be different for each student, there are two primary categories, each of which requires at least one semester of work. The senior seminar: Offered in the winter semester of the senior year, the seminar considers a topic chosen by a faculty member. This seminar is an intense experience involving group work and several presentations in a small classroom environment. Sources are usually advanced readings, either from a text or published paper. There may also be opportunies for students to research their own questions, and then present the results to the class and in writing. Seniors taking the seminar will register for math 495 during the fall registration period. The thesis: Thesis can last one semester or a full year, and requires you to work both independently and one-on-one with a faculty advisor. There are different kinds of thesis opportunities, detailed on the department’s Thesis Information page. To help you decide which format will be best for you, the Department holds an information session during the winter semester. This info session gives faculty and seniors an opportunity to talk about their experiences with the Seminar or Thesis, and gives juniors a chance to ask questions; sophomores and first-year students are of course welcome to participate in this meeting. Faculty attend the first part of the meeting, while the second part is reserved just for students — current and rising seniors, and interested sophomores and first-years too.